Plants that have grown for many years in the special environmental conditions prevailing in mining areas are naturally screened and show strong capacity to adapt to their environment. 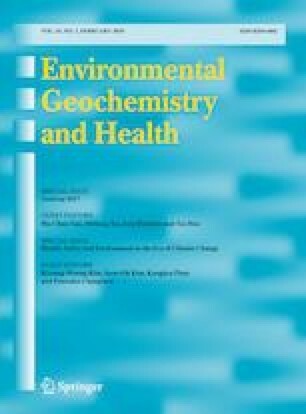 The present study investigated the enrichment characteristics of U and other heavy metals (As, Cu, Pb, Mn, Mo, Zn, Cd, Co, and Ni) in the soil–plant system in Xiazhuang uranium mine. Four dominant plants (Castanopsis carlesii, Rhus chinensis, Liriodendron chinense, and Sapium discolor) and soil samples were collected from the mined areas, unmined areas, and background areas away from the ore field. U, As, Cu, Pb, Mn, Mo, Zn, Cd, Co, and Ni concentrations were analyzed by ICP-MS. The results demonstrate that (1) The highest concentrations of U (4.1–206.9 mg/kg) and Pb (43.3–126.0 mg/kg) with the geoaccumulation index (Igeo) greater than 1 show that they are the main soil pollutants in the research area. (2) The biological accumulation coefficient (LBAC) values for Cd, Mn, and Cu are greater than zero in S. discolor, L. chinense, and C. carlesii and these three plants indicate that they can be used for remediation of the soil in the ore field. (3) R. chinensis inhibits the accumulation of heavy metals and shows sensitive pigment responses to the accumulation of U in the leaves. L. chinense has the strongest enrichment effect on heavy metals but exhibits weak biochemical responses under U stress. C. carlesii demonstrates strong adaptation to U and can maintain healthy pigment characteristics in case of high U enrichment. (4) S. discolor, L. chinense, C. carlesii and R. chinensis have strong tolerance to U toxicity and different biochemical responses. This study received financial support from the National Natural Science Foundation of China (No. 41572316).